Bolivian prosecutors have brought formal charges of genocide against the country's exiled former president, Gonzalo Sanchez de Lozada. The move came on the fourth anniversary of Mr Sanchez de Lozada's resignation following violent street protests at plans to export natural gas. The charges, denied by Mr Sanchez de Lozada, relate to the deaths of at least 60 people killed in the unrest. The Bolivian government is seeking his extradition from the United States. 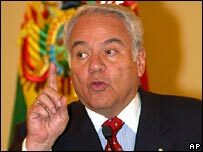 The Bolivian attorney general, Mario Uribe, presented nine charges, including genocide, against Mr Sanchez de Lozada to the Supreme Court in Sucre. Eight members of his government and five high-ranking military chiefs were also charged with a range of crimes, including murder and torture. Mr Sanchez de Lozada has denied allowing security forces to use violence against demonstrators. His lawyer in the US, Howard Gutman, told the Spanish news agency Efe that the charges were due to "the incessant political campaign to punish the political rivals" of Bolivia's current leader, Evo Morales. On Wednesday, a group of protesters gathered outside the US embassy in La Paz to demand that Mr Sanchez de Lozada be sent back from the US to face trial. The Bolivian ambassador in Washington, Gustavo Guzman, said his government would present a formal extradition request to the US authorities at the beginning of November. Mr Sanchez de Lozada fled to the US after the protests brought down his government in October 2003. The crisis had grown as more and more people took to the streets to demonstrate against his free market policies, including plans to export natural gas. Troops were deployed to help combat the growing civil unrest, including strikes and road blockades, and dozens were killed in several weeks of violence. Goni, as the US-educated president was often called, came to power in August 2002 with just 22.5% of the vote, and remained deeply unpopular. The man who came a surprise second in that election, Evo Morales, played a central role in the demonstrations demanding the nationalisation of the energy sector. Mr Morales was elected president in December 2005.